Marked as special at an early age, Jacinda knows her every move is watched. But she longs for freedom to make her own choices. When she breaks the most sacred tenet among her kind, she nearly pays with her life. Until a beautiful stranger saves her. A stranger who was sent to hunt those like her. 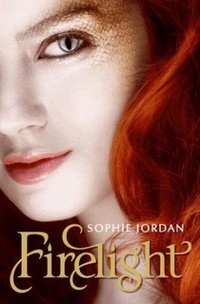 For Jacinda is a draki—a descendant of dragons whose greatest defense is her secret ability to shift into human form. Forced to flee into the mortal world with her family, Jacinda struggles to adapt to her new surroundings. The only bright light is Will. Gorgeous, elusive Will who stirs her inner draki to life. Although she is irresistibly drawn to him, Jacinda knows Will's dark secret: He and his family are hunters. She should avoid him at all costs. But her inner draki is slowly slipping away—if it dies she will be left as a human forever. She'll do anything to prevent that. Even if it means getting closer to her most dangerous enemy.